← Download This Soul Music Podcast Now. Leave it to Sean Four-Fingers. Politics aside, US Press Secretary Sean Spicer should be fired for being an idiot. President Trump is free to choose any Conservative he wants to serve as his mouthpiece. I’m just asking that he chooses among the smart ones. No need for me to break down Spicer’s waves of failing “Assad worse than Hitler” remarks during Passover(!) when Wonkette did a thorough job of that. But United’s depiction of David Dao — the physician they manhandled and “reaccommodated” from their plane TWICE, after issuing him a boarding pass — as a guy with anger management issues makes me wonder about the synchronization of United CEO Oscar Moñoz’ statement and the news story about Dr. Dao being a gay, illegal drug-dispensing emotional firebomb. Speaking of yoking 69-year olds, Why should the airport security guard, who was asked by United to remove Dr. Dao, be placed on leave before disciplining the requestors? Whoever dispatched the guards knew the outcome could be violent. This is just another corporate game of deflecting root causes. Looks like my decision to stay the hell away from United’s Friendly Skies remains on point. I think boycotting Pepsi for trivializing people’s decades of struggle for equality and justice is too lenient. I say let’s shut Pepsi all the way down. Put ‘em out of business. No negotiations, no acceptance of offers to kick in a few dollars to some National [fill in the organization’s name here]’s annual banquet. Lights out. Bye-bye, sugar. Perhaps you’re a Doritos fan (I’m not). Then just shut down Pepsi’s soda division. Or decommission the company’s existence in chunks. Individuals like Spicer, Muñoz — along with the institutions they represent — are quite accustomed to Twitter critics and marches. 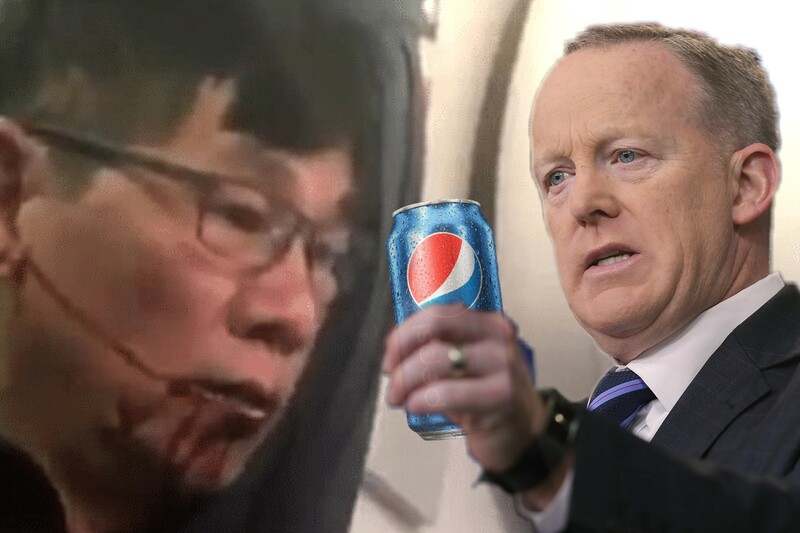 This entry was posted in Politics, Race, Society and tagged black lives matter, pepsi, sean spicer, trumpland, united airlines. Bookmark the permalink.